FIRST OF ALL, IN ORDER TO HAVE THE PROPER PERSPECTIVE ABOUT FITNESS AND YOUR WORKOUT PROGRAM, YOU NEED TO CONSIDER YOUR BODY AS A TEMPLE and NOT A STORAGE ROOM or TRASH CAN! I established a golf trainer home gym system in my house, mainly for my convenience. The golf trainer home gym that I set-up allows me to work on my golf game as well, while I perform my regular workout program. A majority of the elements in my workout are yoga and golf exercises with a medicine ball. I use my golf trainer home gym to develop the critical muscle memory needed for a consistent golf swing that I can perform 10- minutes each hour, or 2.8 hrs/day. That is 19.6 hours/week of incremental training that has the best retention to develop muscle memory in golf swing. 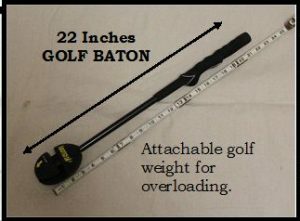 The Golf Baton for using the Overload/Under-load Training Technique to improve the golfer’s speed and power. As part of my relief exercises during the 10- minutes, I include a procedure I call the Overload/Under-load Technique. This is similar to how the batter warms up in the on-deck circle. The weighted bat or donut increases the weight of the bat, allowing the batter to increase their bat speed and power. The golf baton that I made, shown above in the Golf Baton Figure, helps me to develop and maintain my golf swing feel, sequence, and develop speed. This is part of my golf training, just as the 405- Training Drill is. The detachable weight is I Gotcha weight made just for golf clubs. It is important not to exceed 20 percent over what an actual golf club weighs. There are three benefits that the golf trainer home gym provides the golfer. First, the gym provides vital golf exercises that includes working work with a medicine ball for core strength, that is critical. 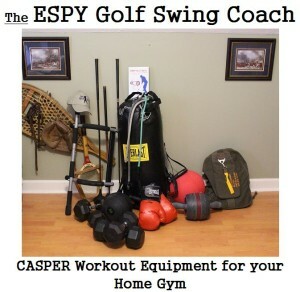 Second, the home gym provides a fitness program to maintain golfer’s strength and conditioning, Third, the home gym provides 2.83 hours of golf training each day, for a total of 86.18 hours per month. This is critical for golfers working on a single-digit handicap. The golfer going through the home gym workout reinforces their muscle memory and golf swing routine. Besides the convenience my golf trainer home gym provides, the home gym also helps me maintain the only body I have to enjoy the game of life. Besides the convenience the golf trainer home gym provides, the home gym can be integrated with a regular gym membership that you may have. I’d like to point out that I use my golf trainer home gym as a strength and conditioning technique more than the sole purpose of losing weight. I have worked out since I was twelve years old. I never could maintain or lose weight by just working out in the gym. I had to include a diet plan with my home gym workout program. I had an incentive to lose 35 pounds that I gained, just before I had my right hip replaced. 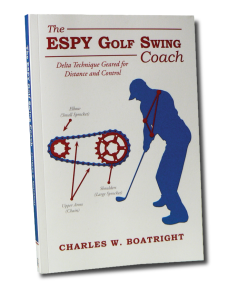 Just after my surgery, I was doing commercials and YouTube videos for my book, The ESPY Golf Swing Coach. It only took me viewing one video that I did to convince me that I needed to do something else besides just work out to lose my 35 pounds. I also needed to develop an effective diet plan as well. My goal was to lose 35 pounds and obtain a 32 inch waistline. I actually exceeded that goal by losing 40 pounds and obtaining a 29 inch waistline. To the untrained eye this photo might appears as if I’m trimming around my farm. But actually I’m working on my golf game. 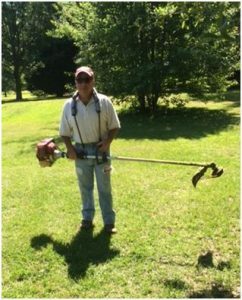 Using a grass trimmer is a great workout to build core muscles for making a consistent golf swing. 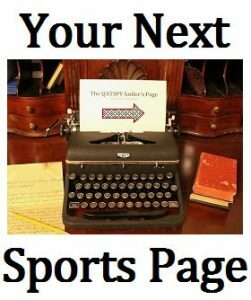 About six years ago, I refined an existing workout program I have used since I was eighteen years old. I updated it to tailor it more for my golf game. I focused on more golf exercises with a medicine ball to develop abdominal muscles for core strength stability in my golf game. 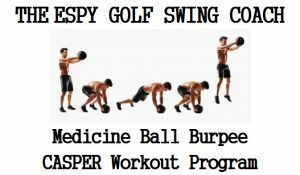 A few of these golf exercises with a medicine ball are included in the following figures: Stocking the Shelves and the Medicine Ball Burpee. 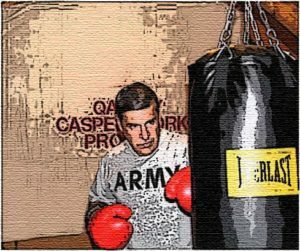 I also include in with the CASPER (Cardio, Aerobic, Strength, Plyometrics Exercise Regimen) Workout program a boxing bag workout. 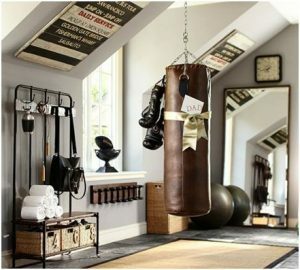 Essentially, I trade in my golf glove and golf bag for EVERLAST boxing gloves and a boxing bag. You will be surprised with the amount of stamina you gain, along with a full-body-workout. A 80 Lb Boxing bag with 12 oz. EVERLAST Boxing gloves a part of the CASPER Workout Program. NOTE: One of the most important benefits of working out with a weights is not only the additional muscle mass that is added, but also the conditioning and stamina gained. Also, if the person wants to lose weight, they need to start lifting weights. Higher (not faster) Reps with moderate weights is the best workout technique for golfers. The golfer can use heavier weight training, but maintaining flexibility is essential. The golfer needs to focus on using lighter weights to retain their flexibility. I also include Yoga between my exercise elements during my rest periods. This allows the body time to absorb surplus Lactic Acid, which causes discomfort and possibly injuries to occur. 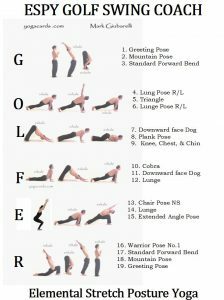 I use the GOLF Yoga Chart to integrate into my CASPER Workout Program to maintain flexibility, that is critical in golf. I usually use tier G and F for my warm-up periods to my golf rounds my 405- Training Drill. Also for cooling down and additional absorption of Lactic Acid, I take the opportunity to enjoy a walk with my dog. I think he enjoys it more than it does be good. You will be amazed at the benefits it does for you and your dog. Morning Joe, Your Golf Swing Workout Partner!